Ukrainian authorities should step up measures to guarantee the safety of journalist working in the country after opposition columnist Oles Buzina became the latest victim in a recent series of murders in Ukraine, media activists told Sputnik. MOSCOW (Sputnik) — Oles Buzina, a former columnist and editor of the daily newspaper Segodnya, was shot dead in Kiev by two masked gunmen on Thursday. "We welcome President Poroshenko's call for an immediate and transparent investigation, and urge that the Ukrainian authorities take steps to ensure the full protection of journalists," Katie Morris, Head of Europe and Central Asia program at the ARTICLE 19 organization, said. The freedom of expression campaigner added that any murder of a journalist was "utterly unacceptable." Fellow journalist Graham Phillips, a stringer for the RT news channel, said that the murder of Buzina was both predictable and shocking. "Predictable, because Oles was the third person linked to anti-regime views killed in 3 days. Shocking, because you can't quite believe this is happening, for Ukraine to really be so lawless — it's like something out of the Godfather," Phillips said. The British stringer referred to the Hollywood crime film, telling the story of a fictional New York mafia clan, as the fatal shooting of Buzina came less than a day after former lawmaker Oleh Kalashnikov was murdered in the Ukrainian capital on Wednesday. 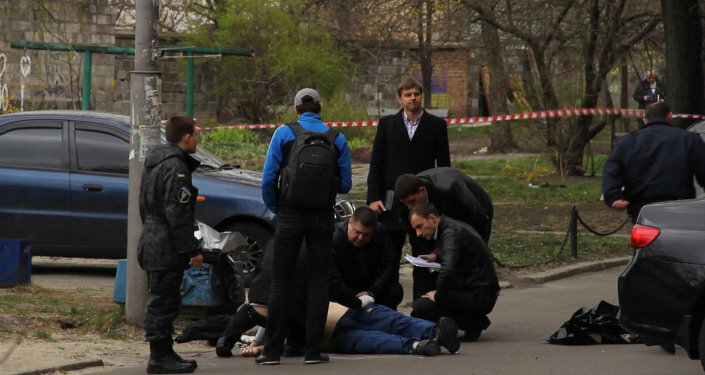 A third opposition figure, Donetsk freelance journalist Serhiy Sukhobok was killed on Tuesday. "Even typically pro-Kiev journalists, such as Shaun Walker of the Guardian, have expressed shock at the execution of Buzina, which takes the total of anti-regime figures either killed or found dead in suspicious circumstances, to at least 10 in the last couple of months," Phillips said. Phillips also said that Buzina had moderate views and it was "tragic" to see him killed at the age of 45. The European Union has condemned the recent killings while the UN Human Rights Council has called for a "swift and credible" investigation into the murders.